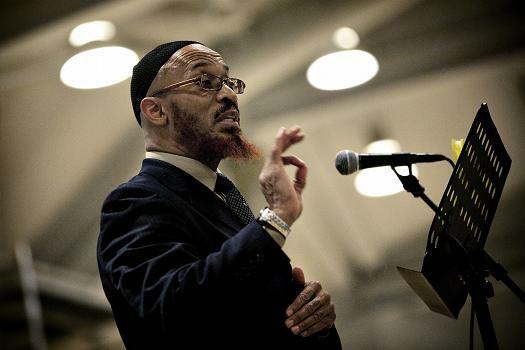 NewsRescue– Renowned American-born Sheikh Khalid Yasin has chastised Muslim youth who set off for a questionable Jihad, whereas their state of affairs precludes their venturing to such cause. At a conference in Scandinavia, titled, “The Facebook Mujahideen,” the fiery Sheikh said many of the youth leave behind families they have responsibilities to; brothers who he says do not wake up for prayers, do not perform Hajj, do not respect their parents and then feel inspired by “Sheikh Facebook,” “Sheikh Google,” and then they decide to abandon their responsibilities and pick up and go to so-called Jihad. Sheikh Yasin said the people should be grateful to their environments, even those of their host communities in Europe and America. He said the prophet commanded people to be responsible and grateful to their host community. Telling the youth to be appreciative of technology and other tools that after-all bring the information into their living rooms, that made them know of Syria and feel like going there in the first place. He spoke specifically about Syria, explaining that perhaps people can find other ways and tools to help the situation in Syria. That the prophet of Islam once said the person who gave the Mujaheed a horse to use got the full reward of Jihad. He said the intention should be serving humanity, the issues of Islam, the Muslims and to do this, the first Muslim to serve is yourself, your family, your neighborhood, the society where you live. Further saying that this is not the first time that Muslims killed, or raped. He said this happened in the Caliphate of Ali, less than 40 years after the death of the prophet, but Ali did not declare war against the fellow Muslims. He advised that before any youth goes to Jihad he must first get permission from Imam’s or Wali from their locality. or the son – he disrespects his mother and father, yet he wants to go make jihad. The Son, – he wants to leave his home to go perform jihad, when he doesn’t pray, fast, let alone take care of his brothers and sisters. The Shaykh only addressed his comments towards those irresponsible Husbands and son’s who want to perform jihad not those who have the legitimacy to go.